If you’re working 60 hours a week and caring for a sick family member, are you really going to attend the five-times-a-week, 5 am workout bootcamp? If you’re going to grad school and interning with a 60-minute commute are you really going to cook anything out of that super complex cookbook? Will you want to temper chocolate and whip cream on your one day off? The answers to these questions might be yes. Maybe attending a 5 am bootcamp sets you up for a productive day. Maybe cooking helps you take a break from writing your thesis. If that is the case – congrats! You are a superhuman! Do you move every year, usually to a third floor walk-up? And you ask your increasingly-annoyed friends to help you move? Perhaps now is not the time to buy the sectional sofa and upright piano. Do you live somewhere the temperature rarely dips below “face-meltingly hot”? Then shorts and sandals would probably be better investments than a $200 winter coat or those Joan of Arctic boots. Do you have three cats who push things off every flat surface? Hello, cute melanine dishware and plastic water bottles. Goodbye, expensive glassware. What does your previous behavior look like? Sometimes, people really do change. They pick up new hobbies, they change their habits, they dramatically alter the way they live their lives. But it’s also important to be honest with ourselves. If I’ve spent hundreds of dollars over the last few years trying to develop a workout habit, will this pair of $70 yoga pants be The Thing that gets me to work out consistently? Maaaaaybe (but probably not). If I’ve bought 17 different organizational tools and they’re all sitting unused in my basement, will another trip to the Container Store change anything? If we’ve tried to solve a specific problem with purchases in the past and it hasn’t worked, it probably won’t work this time either <- things no one wants to hear. Before any of us buy more running shoes, self-help books, or closet organization systems, let’s be honest with ourselves about why all the other stuff hasn’t worked. Are we self-sabotaging? Afraid of failing? Are we only doing this to please or impress others? Maybe we don’t actually care about organizing our closets AND THAT IS TOTALLY OKAY. It’s hard to make real change in our lives if we don’t understand our motivations and behavior. Related: How to stop engaging in self-defeating B.S. What do you actually like to do? I wish I liked riding bikes and going to breweries but I really, really don’t. No matter what type of bike I buy, I will be stressed out by riding on city streets. No matter how cute the pint glass, I will not like beer. Similarly, if you don’t actually like camping, stop going to REI and buying $80 sleeping pads. You don’t like sleeping on the ground in nature! That’s okay! You don’t like wearing Spanx and high heels and buying $13 cocktails on a Saturday night? Your friends will probably still like you if you skip the nights out at the club. Of course, there is something to be said for buying things that will help us do the things we want to do. It’s hard to become a runner if we don’t have running shoes. It’s challenging to host dinner parties if we only own two plates, one spoon, and three forks. But there is no bylaw requiring us to spend $250 on serving ware before we start entertaining more. We could spend $20 at Ikea, host five dinner parties, and then decide if we need the gravy boat. We could start a Couch-to-5k program with $50 running shoes and the sweats and t-shirts we already own. It’s doubtful that any purchase is going to change your intrinsic nature or the unavoidable, non-negotiable realities of your daily life. I can’t buy my way out of this era of my life and the pet hair and teenage boys smells. 15 pairs of Louboutins won’t change my distaste high heels. Buying a juicer won’t make me someone who wants to juice things. Be who you are, live your life, and buy things that fit the life you’re living today. I want to hear from you! 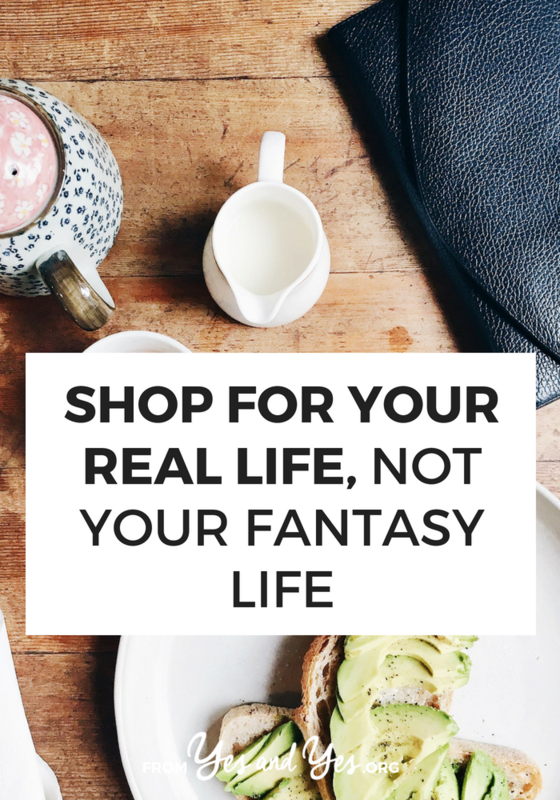 Have you ever been guilty of buying things for your fantasy life rather than your actual life? Share in the comments so I know I’m not alone! P.S. If you’re nodding along, we talk about stuff like this every day in my free, private Facebook group Money & Happy. Click here to join us! I’ve actually gotten a LOT better with myself when it comes to buying only what I need! My weakness is still grocery – I get so attracted by fresh produce on discount, then I can’t finish everything before they rot. In my fantasy, I cook every single night and day and make always try new recipes. I’m not far off from that in reality in that I do cook daily, but I hardly ever try NEW recipes… which means spur-of-the-moment ingredients always go to waste. Oh gosh, you could have written this post for me. I also spend way too much having a stock of pantry items even though I aspire to be a great menu planner. I also love cook books and magazines which I earmark recipes in but dont try new recipes anywhere near as often as I would like to. I have a whole drawer full of clothes that I either bought at my thinnest or bought thinking “oh yeah I can lose a few pounds and then it will look great!” I periodically think about getting rid of them, but then I remember the money I spent and think to myself “if I can just lose 10lbs I can basically have this whole new wardrobe!”. Part of this ridiculous mentality comes from wanting to use what I have rather than buy more. Eating vegetables and losing weight will have the triple benefit of making me healthier and allowing me to wear these unworn clothes AND saving me money! Until I resolve this dilemma I shall be wearing the two pairs of trousers I have that do fit and a rotation of tops that I don’t especially like. Fun! Planners. Do you know how many planners I’ve purchased thinking that THIS PLANNER will be the magic system that makes me feel in control and not overwhelmed with life?? Those things can get expensive. I’ve rarely used any of them. Planning things out with adorable stickers is great, but it really doesn’t fit my life. We’ve all been there! People are always oddly disappointed when I tell them that my planner is a $2 notebook! I have four cats and have spent way too much time, money and glassware trying to be the house with a pretty vase of fresh flowers on the table. Letting go of this saves me $6.99 every time I go to Trader Joes. Yes! Now I only buy potted plants with ‘thick’ leaves because if it’s too paper-y or grass-like my cat will eat it! I love this. I have never realized I was buying for my fantasy self, but yes, I have definitely done that on many occasions. I’ve gotten a lot better over the years but like Charmaine I do still buy many fresh vegetables and herbs only to quiltfully watch them rot away. Not buying them would make me feel even worse though. Yes! It can be hard to toe the line between buying things that will help you be better version of yourself and buying things for the fantasy version of yourself that will never exist no matter what! Love this! But as someone who does not particularly enjoy cooking, I do like the instant pot. There’s a “dump and push start” instant pot Facebook group and I actually do use some of the recipes listed there! Sarah you’re such an excellent and relatable writer. One time I bought a food processor the size of a spaceship, because the video showing it shedding a block of cheese was amazing. I’ve never actually used it, and I always buy my cheese shredded anyways! Such good advice to get ‘real’ with our life. Another fantastic post that really makes me reassess my life choices. I don’t know how you do it, but it’s like you are inside of my head and my home. Love this mindset!!!! Great post. As I get older, I find if I research the heck out of new purchases, I make better decisions. Why won’t I get a Vitamix? Too loud!! !